GOO GOO G'JOOB. YOU GUYS. THE BEATLES. THAT HAPPENED. It was by far the most anticipated performance of an otherwise unwatchable mess that is the 2014 Grammys. If there was ever a reason to tune in to "Music's Biggest Night," it was that very performance — two living legends on stage together, making us feel that all was right with the world. John's technocolor piano. Ringo's happy little head bobbing to the beat. You guys! EVEN YOKO WAS DANCING. Yoko Ono. Dancing. To Paul and Ringo. The Beatles were this year's recipients of the Recording Academy Lifetime Achievement Award and Paul won Best Rock Song for the track "Cut Me Some Slack." Fellow collaborator Dave Grohl did all of the talking for that award and he rightly put it that were it not for The Beatles, he and everyone else on the stage with them would have never been possible. And when Paul and Ringo took their bow together, the whole room was on their feet because, The Beatles are to music as Meryl is to acting, and then some. Though the two played a track from Paul's latest album New, Ringo had his very own performance earlier in the night. After a completely awkward introduction by Black Sabbath, Ringo Starr took to the stage to sing his song "Photograph" while photos of the Beatles' drummer's past were projected behind him. The images of a young George Harrison actually brought tears to my eyes and the candid shots of the Fab Four in their many iterations were truly heartwarming. I had to give Ringo props for taking the moment to have the song and the stage to himself. He's the guy that sat behind John, Paul, and George for all of those years and notoriously didn't get much artistic credit. It was his time to shine in his sparkly jacket and it was such a touching performance. Even after Jamie Foxx did a terrible and insulting British accent afterwards. But, I digress. 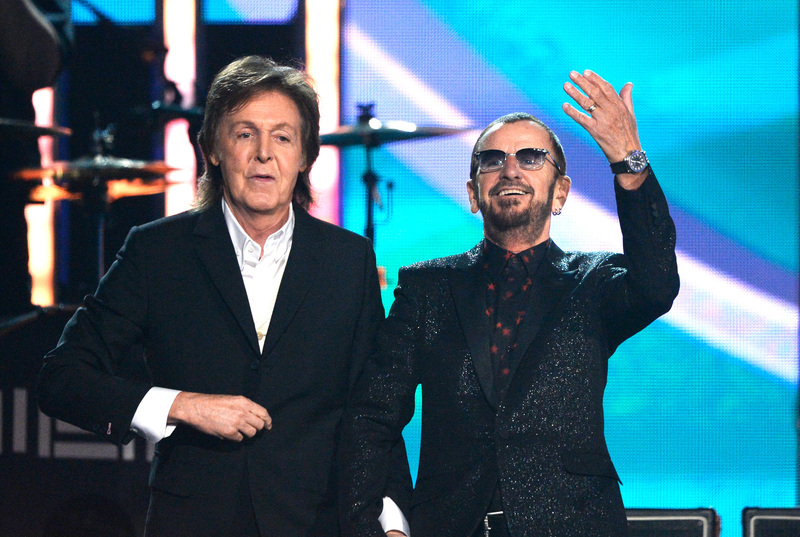 After Paul and Ringo's performance, my heart soared, it really did. Sure, it wasn't the most exciting performance in Grammys history, but the fact that any of us get to see these guys perform together is a moment many generations to follow will wish they had. I grew up on The Beatles and came to resent/shrug off/roll my eyes at anyone who claimed, "I just don't get The Beatles" or "The Beatles were so overrated." People who say those things are the kind of people at your office who complain about the catered lunch at a meeting EVEN THOUGH IT'S A FREE CATERED LUNCH. The Beatles are the greatest rock band in history for a reason. And our collective heads hang in shame.